Gourmet level candy shell drops in beautiful colors. The smooth candy shell surrounds delicious milk chocolate. Rich, milk chocolate is coated with a smooth colored candy shell. Ideal for dessert toppings, decorating baked goods, or just snacking. Approx. 480 pieces per pound. Made in USA. Similar to MMs in size and shape. Visit us at www.pearlscandynh.com and search for drops. Available in-store and online. $8.99 per pound. Visit us at Pearls for all your hopping treats! Hate enjoying just a few pieces from those large pre-assorted store hearts? Take the waste out of Valentines and visit our store to create a custom heart with just their favorites. 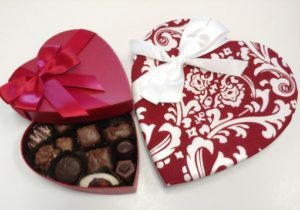 All your Valentine candy and chocolates for NH and MA. 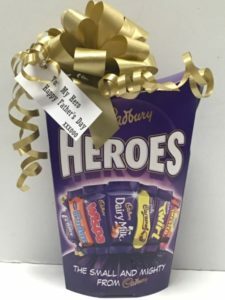 Delicious sugar free chocolates too! 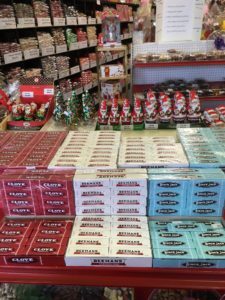 Beemans Gum, Black Jack Gum & Clove Gum r back in stock! Yes, they are back in stock! Beemans, Clove and Black Jack gum. Visit us online or in store to grab yours! 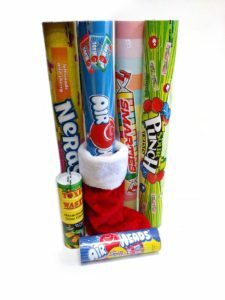 Oh my gosh, how am I going to fit all of these mega candies in my stocking?! Hostess gifts and nut trays for a great Thanksgiving! 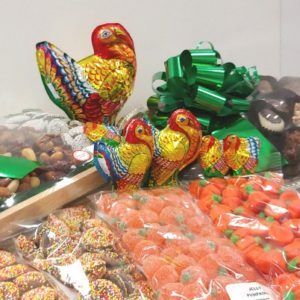 Visit Pearls Candy NH for all your chocolate turkeys, Hostess gifts and nut trays. 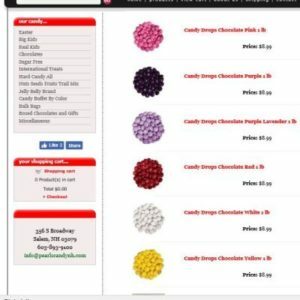 We have several styles available or you can mix and match your own perfect mix. Are you ready for Halloween? I know we are! 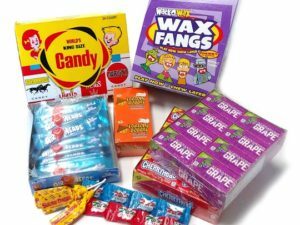 Grab all your classic favorites and new candies that kids love! Peanuts are not nuts. 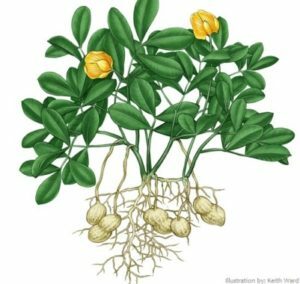 They grow underground and are part of the legume family. Peanuts are an excellent source of several B vitamins, vitamin E, manganese, magnesium, phosphorus, antioxidants and dietary fiber. They also contain about 25g protein per 100g serving! In the US by law, any peanut butter branded product must be at least 90% peanuts. It takes about 540 peanuts to make a 12oz jar of peanut butter, approx. 45 peanuts per ounce of peanut butter. Women and children tend to prefer creamy peanut butter, while most men opt for chunky. East coasters prefer creamy and West Coasters lean towards crunchy style. The Huffington Post in Sep 2014 asked, “What makes the best peanut butter and jelly sandwich? Results: 36% say strawberry jam is favorite (grape is 31%); favorite bread is white bread (54%); favorite type of peanut butter is smooth (56%) and 80% like their PB&J with the crust left on. Arachibutyrophobia is a fear of peanut butter sticking to the roof of one’s mouth. There are two former presidents who were peanut farmers: Jimmy Carter and Thomas Jefferson. There are six cities in the US named: Peanut, CA; Lower Peanut, PA; Upper Peanut, PA; Peanut, PA; Peanut, TN and Peanut, WV. At Pearls, we have over 60 peanut made, filled and flavored treats. 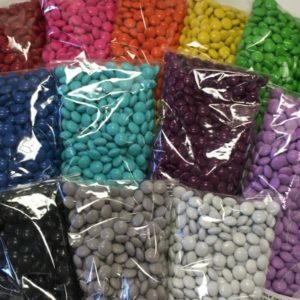 Not including Circus Peanuts – haha! Can you believe another snow storm overnight and Easter just 10 days away? 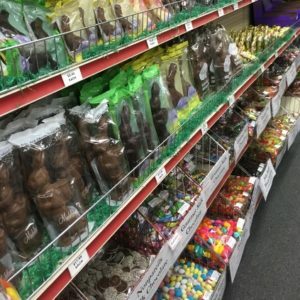 Wanted to share a few Easter baskets available in store. Several styles and different pricing options available. 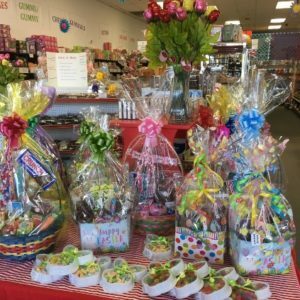 Visit us for all your Easter treats, supplies and baskets.